Johannes Modise, or Joe, as he is known to family, friends and comrades, was born in Doornfontein, Johannesburg, on 23 May 1929. He was the only child of Miriam and Ezekiel Modise. Modise completed his Junior Certificate at the Fred Clark Memorial School in Nance Field. He had to leave school in order to work and contribute to his family's income. His parents impressed the importance of education on the young Modise and, consequently, he obtained his matric certificate through private study. His first job was as a driver for various companies. Modise joined the African National Congress Youth League (ANCYL) in about 1947 in Newclare and became one of the organisation's organisers. When the Strijdom government declared Sophiatown a White area the residents who were threatened by the demolition of their homes and political organisations, such as the African National Congress (ANC), organised themselves in the Western Areas Protest Committee. Modise was very involved in the one-day work stoppage in 1955. His political activities as an organiser against the Sophiatown removals led to his first arrest in 1954. He was also actively involved in the political campaigns against the introduction of Bantu Education in 1953. Modise was one the 156 people whom the South African state identified as leading figures in the Freedom Charter movement. They were charged with treason. The government claimed that they were working systematically towards the overthrow of the South African state. Modise was amongst the 73 trialists against whom charges were dropped. By 1960 many of the acts of resistance were directed against the implementation of the Pass Laws. On 21 March 1960 the Pan Africanist Congress (PAC) organised an anti-pass campaign. The ANC and the PAC were banned in the wake of the brutal crushing of the campaign by the South African police. Modise played a key role in recruiting people for Umkhonto we Sizwe (MK) and arranging for them to leave the country for military training. As of 1962 he was instructed to leave his job as a driver to work as an organiser for MK on a full-time basis. In 1963 MK ordered Modise to leave South Africa because the police wanted to detain him. This information was garnered from captured and exiled MK members who had implicated him in the military activities of MK under the pressure of interrogation and torture. MK's executive determined that Modise should undergo military training in order to lead its military personnel. He was also charged with the additional responsibility of the procurement of arms. Modise's training took him to the former Soviet Union, the former Czechoslovakia, Cuba and Vietnam. In 1964 he returned to Tanzania, from where he was involved in the re-organisation of MK and its training programmes. He served as a commander of MK from 1965 to 1984 because of a spate of arrests, including that of Nelson Mandela, the first commander of MK. In 1965 he was also appointed to the National Executive Committee of the ANC, an explicitly political office. Modise was also responsible for planning joint actions with the Zimbabwe People's Revolutionary Army (ZIPRA), amongst others, in order to establish a route for South African cadres to enter their homeland. This plan was, however, unsuccessful. Modise was both a soldier and a political leader. His stature in the ANC was re-affirmed in 1985 at the Kabwe Conference where his position on the national executive of the ANC was confirmed. Upon the release of Nelson Mandela, and the subsequent unbanning of the liberation movements, Modise was one of the advanced group of ANC leaders who were tasked with entering into discussions with the National Party government at Groote Schuur. This meeting resulted in the formulation of a document, the Groote Schuur Minute, which prepared the way for the return of exiles and a negotiated an end to the apartheid system. During 1993 Modise was instrumental in negotiating the integration of officials of the South African Defence Force (SADF) and those of the liberation armies. Apart from this task Modise served on the defence sub-council of the Transitional Executive Council from December 1993 to April 1994. After the first democratic elections in April 1994 President Nelson Mandela appointed him as South Africa's Minister of Defence. In May 1994 Modise advised weekly Mail & Guardian newspaper of his intention to seek an interdict to restrain the publication of further material on the SADF's former Directorate of Covert Collection (DCC). Modise came under fire for this action from within his own ranks as the ANC's policy was to encourage transparency around former covert action. He was forced to withdraw the interdict. Modise's professional contribution to overthrowing apartheid and to establish a new democracy has been recognised. On 22 November 2001 President Thabo Mbeki awarded Modise the Order of the Star of South Africa (non-Military), Class 1: Grand Cross (Gold). Years of hard work as a soldier and a politician took its toll on Modise's health. In 1992 he suffered a mild stroke. He continued with his work and was re-elected to the ANC's national executive committee at its December 1994 conference in Bloemfontein. Later Modise contracted cancer. 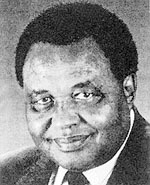 After an illness borne with stoicism, Johannes Modise died at his Pretoria home on 27 November 2001.